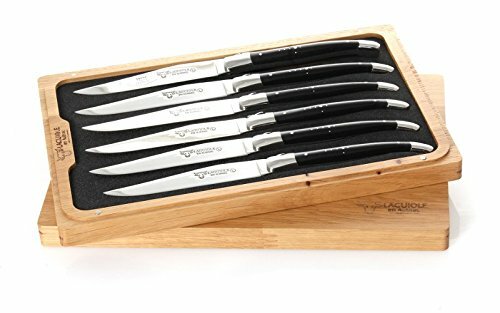 6 steak knives with a fixed blade. The workmanship of the handle is identical to the famous Laguiole en Aubrac pocket knives, which preserves the typical form and striking appereance. Also the selection of materials is kept the same: While the blade is forged from only the best swedish Sandvik steel, the handle is cased with high-quality ebony wood and the interjacent steel plate elaborately crested. Handmade in France. Comes in an elegant wooden gift box. The Laguiole en Aubrac table knife collections offer individually crafted cutlery with the perfect quality in blade and handle you can find on the worldfamous pocket knives. !! !Natural product. Handle design might vary!! !